French Emblems: Emblem: Nullum malum solum: vel, Uno bono sublato, mille existunt. Uno bono sublato, mille existunt. Nothing is purely bad: or, if we take one good thing away, a thousand spring up to replace it. Cuius ab abscisso vertice crevit opus. Aucta renascuntur, caedeque monstra valent. Augescit numerus, vim cumulatque dies. Link to an image of this page [I6r p139]Damna, labore novo pristinus estque minor. Uno omnes cupiunt pro Cicerone loqui. Una ubi finita est caussa, decem redeunt. 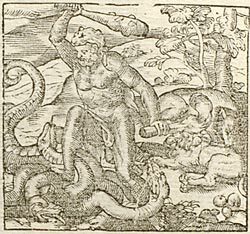 Although the mightiest monsters and the most violent domestic animals challenged the hands of Hercules, still nothing annoyed him (indomitable as he was) more than than the Hydra, from whose truncated head labours grew. And the more he hacked its many throats, the more the heads grew back on all sides, from every neck, and death only strengthened the fiends. In the same way, if people are tortured undeservingly by fate, the evils grow in number, and their strength grows day by day. And if poor mortals free themselves from one, a thousand more injuries come running, and the old annoyance is smaller than the new. But speak this too of those brought up in an envious age. All wish to speak in place of Cicero, even those racked by trials and the wrath of judges. When one case is finished, ten more follow! 1. For a similar treatment of the Hydra theme, compare Corrozet: Hecatomgraphie: [FCGa065].